Most smart thermostats these days allow you to set their current temperature right from a Home screen. These t-stats show the home screen by default. And unless the screen is locked, you can adjust the temp simply by touching the right areas on the Home screen. In this piece, we show how to set Honeywell RTH9580WF thermostat temperature by just this way. But if your t-stat screen goes blank when idle, just touch the screen area. This brings back the screen to life, similar to our RTH9580WF Wi-Fi thermostat pictured next. Honeywell RTH9580WF smart thermostat, now locked, displaying Its -Home- screen. Press the UP arrow on the right side of the Home screen to raise the temperature, and press the DOWN arrow to lower it. Each press raises or lowers the current temperature by one degree. Now you might not be able to change the current temperature if your thermostat screen is locked. You might see the following screen in that case. 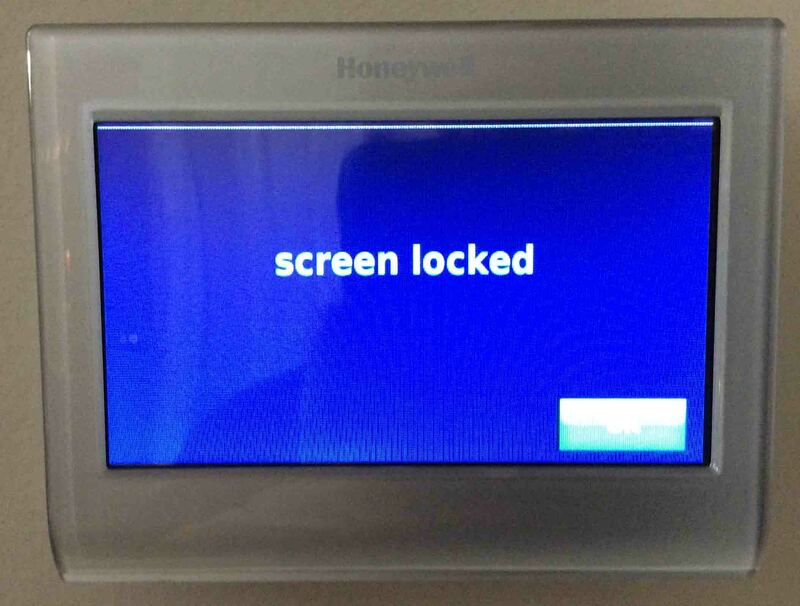 Honeywell RTH9580WF smart thermostat, displaying its -Screen Locked- message. How to set Honeywell RTH9580WF thermostat temperature. If your thermostat is locked, then you’ll need to either unlock it before you can change its current temperature setting, or access it via the Honeywell Total Comfort Connect web site or app. See our How to Lock and Unlock Honeywell Thermostat RTH9580WF post for how to unlock your smart Honeywell thermostat. 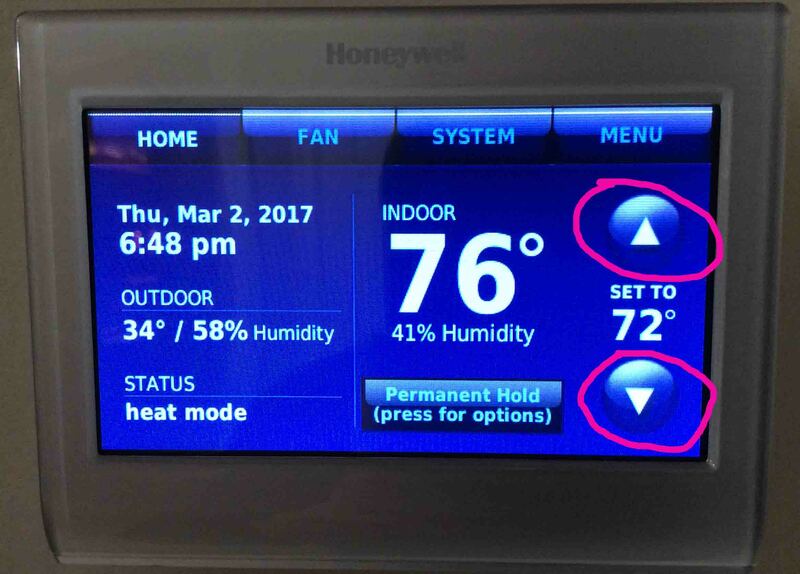 If your thermostat is following a program schedule, when you touch the temperature arrows, you’ll be prompted whether to switch to permanent hold or temporary hold, as shown in the next picture. While ours was following a schedule, we attempted to locally change its temperature to 69 degrees, and got the following Hold Switch screen. Honeywell RTH9580WF wireless thermostat, displaying its -Hold Switch- screen. Here we could either press the Switch to Permanent Hold button, which places the thermostat into permanent hold mode. Or we could just press the green Done button, which places the thermostat into temporary hold, until 10:00 PM in this case, as shown in the HOLD UNTIL field. 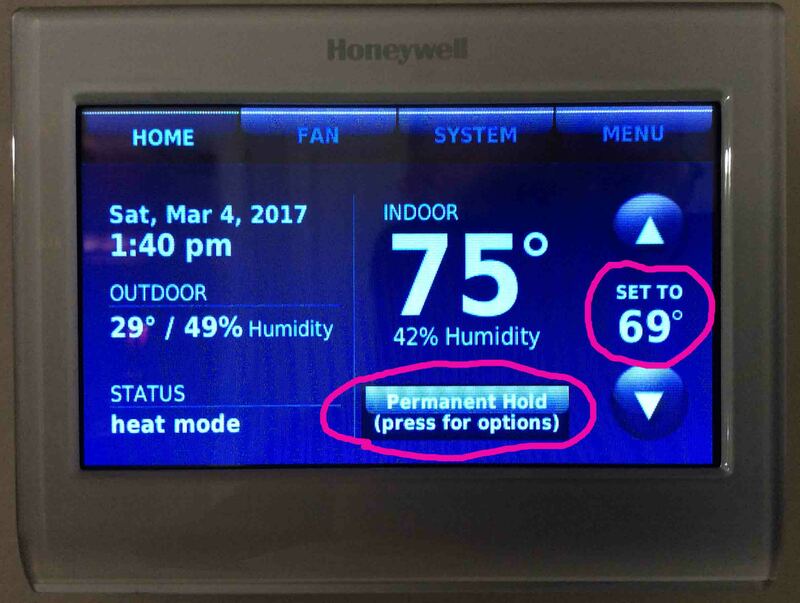 If you opt for temporary hold, you can set the time you’d like the programmable thermostat to resume following its programmed schedule, by pressing the UP and DOWN arrows in the HOLD UNTIL field area on the screen above, until the desired ending time for the temporary hold is displayed. By default, the RTH9580WF switches back to schedule following at the next scheduled temperature change time, which in our program, is 10:00 PM. The temperature of 69 degrees we just set, will remain in effect therefore, until ten PM. At that time, the temperature set in the programmed schedule to occur at 10:00 PM will be applied, and our temporary temperature setting will be lost. 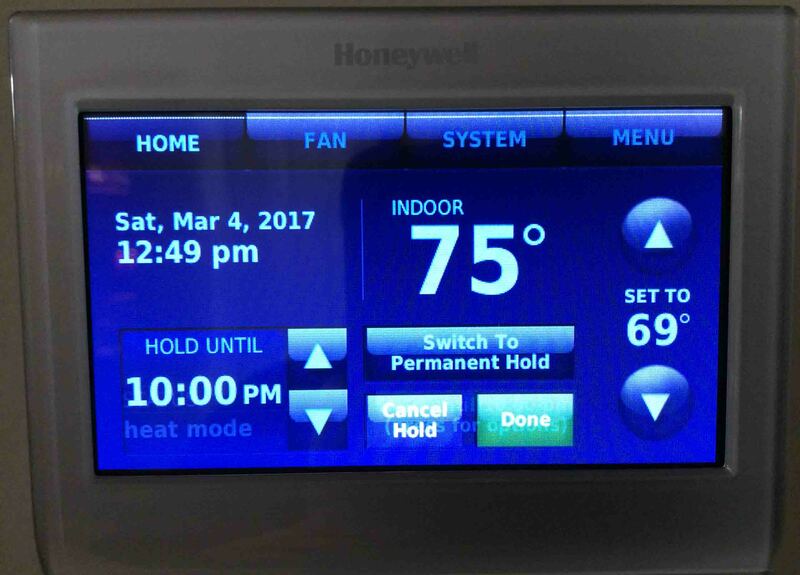 Honeywell RTH9580WF wireless thermostat, displaying its -Home- screen, with the temperature set to 69 degrees, and in temporary hold until 10:00 PM. How to set Honeywell RTH9580WF thermostat temperature. You could also opt to keep your new temperature setting in effect indefinitely, by switching to permanent hold. Press the Switch to Permanent Hold button for this, and then you should see the following screen. Honeywell RTH9580WF wireless thermostat, displaying its -Hold Switch- screen, with -Permanent Hold- selected. From either the permanent hold or temporary hold versions of this screen, you could cancel the hold altogether by pressing the Cancel Hold button. Doing so would return your thermostat to Following Schedule mode, and thus, undo the temperature setting you just entered. The scheduled temperature for the current time would then take effect once more. Some kind of hold must be chosen in order to keep your temperature change. To opt for permanent hold, press the green Done button. This takes you back to the Home screen, where you can see that the new temperature is in effect, and that the thermostat is in fact, in a permanent holding pattern, as shown in the next screen shot. 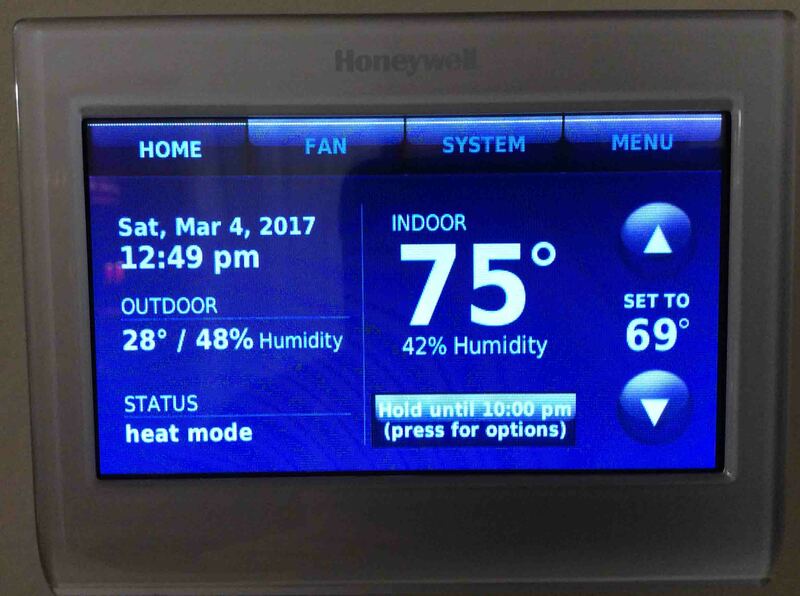 Honeywell RTH9580WF wireless thermostat, displaying its -Home- screen, with the new temperature of 69 degrees set, in -Permanent Hold- state. How to set Honeywell RTH9580WF thermostat temperature. 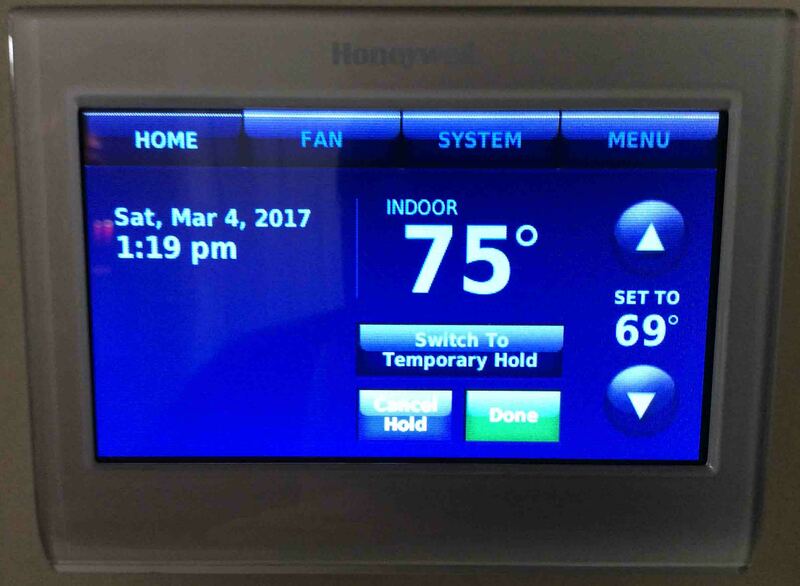 If you have set up an account on the Honeywell Total Connect Comfort web site, and have registered your thermostat there, you can adjust its current temperature setting remotely, on that web site. Honeywell Total Connect Comfort web site, displaying its login page, with active account info filled in. Visit the TCC web site, and log in with your previously set up TCC account. You’ll see the TCC home screen then. If you have more than one registered smart thermostat on your account, then you’ll need to select the one whose current temperature setting you want to adjust. Ours looks like this. We’re going to adjust our unit called THERMOSTAT in our apartment group. 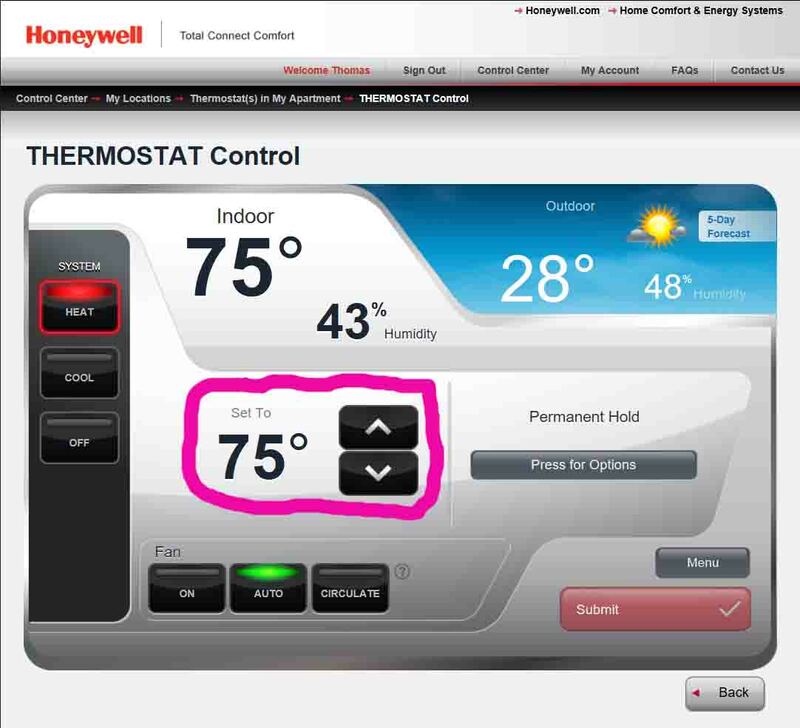 Honeywell Total Comfort Connect web site, displaying the thermostat control page for a particular thermostat, with the current temperature control circled. How to set Honeywell RTH9580WF thermostat temperature. Press the UP arrow in the center of the thermostat control screen pictured previously, to raise the temperature, and press the DOWN arrow to lower it. Each press raises or lowers the remote thermostat’s current temperature by one degree. Then once the temperature you desire is displayed, press the red Submit button, to send the change to your thermostat and bring it into effect. The new setting will take effect within a minute or so. Doesn’t matter whether your thermostat is locked locally; you can still change its current temperature remotely, without unlocking. Note that the entire discussion about permanent and temporary hold above, also applies when you reset the thermostat temperature remotely. However, we’re not going to include the screen shots from the TCC website here, unless readers request them. Again, you’re done! You’ve now successfully changed your Honeywell wireless thermostat temperature setting. 2019-04-12: Added key phrase targeting and removed ad code.